I was devastated to learn about the tornado in Joplin, Mo. this morning. Very tragic news indeed and our hearts and prayers go out to the fine folks of Missouri this morning. As promised I wanted to continue my discussion on the difference in pianos. On the last blog we talked about China and the other Asian pianos. While I did not go into depth on the post about these pianos I spoke directly to tone characteristics. I wanted to explain a few thoughts. Pianos coming from Asia are often somewhat brighter and more dynamic in sound presentation which is fine. I find it akin to taking the stereo and pulling the bass out and turning the treble all the way up leaving the sound to be somewhat “thin” and not full bodied. Many piano manufacturers have addressed this problem. Pearl River for one has hired Lothar Tomar of Bechstein Pianos to redesign thier pianos and what has happened as a result is that the Pearl River pianos of today tend to have a more full bodied tone and more identifiable sound characteristic than before. Brodmann for another has also accomplished this. Delivering a brighter tone but with more depth and character than most of its counterparts. As we move to the United States we have to take a step back and look at the tragic history of piano building and where we are today. The Pierce Piano Atlas is filled with manufacturers from the U.S. who are no longer in business or are 100% built in China, Indonesia or Japan. I find this tragic, not from the stand point that the Asian influence is inferior, but, from the aspect that the employees no longer have jobs and their knowledge has left our industry. We only have three piano manufacturers left in the United States that are recognizable. The first and most obvious, of course, is Steinway. While Steinway and Sons continues to be built in New York, as always, they also produce two other piano lines. Those lines are Boston from Japan and Essex from China. While they say that they are built to their own specifications, this writer has some doubts to that claim. Mason and Hamlin is another piano company that is a very celebrated piano among pianist. Mason and Hamlin has a somewhat more bright and clearer tone than its counterparts and is a fine instrument. There is some debate as to how much of the piano is actually built in the United States and how much comes from “world sources” they do continue to build very fine pianos right here in the U.S.
Lastly, I have to mention Charles Walter. This is a very classy act. although they are not as celbrated or as heralded as its two competitors, it is still a very nice piano. Somewhat more mellow in tone and never really known for their grand pianos although they do have a couple in their offerings. As you look at the line up it is very sad to see that in a country as large and as musically influential as the United States we are unable to support more than three piano companies. I believe its time for a change and that we, as a music community, should put our heads together and find a way to compete internationally with other piano manufacturers. I will continue this discussion on tone character in US pianos soon. I am probably asked at least once during a sales presentation the difference in pianos and why one may be $2500.00 and the next piano of comparable size is $7500.00. Pianos now come from at least three main areas of the globe. #1 by far is the production that is going on in Asia. Whether Japan, Korea, Indonesia, China or Vietnam (yes, Vietnam) the largest percentage of piano being produced now are from Asia. Years ago when you spoke of an Asian piano it was with some disdain that you even mentioned it. While some still don’t like it, the truth is that they are doing a really good job in building pianos. For some time we have identified Asian pianos with a really bright, almost “tinty” sound. Today we are seeing many pianos such as Pearl River’s Rittmueller, Perzina, Brodmann and others that are arriving from China in a near perfect tuning, good regulation and a European smooth sound. It has been an incredible change in production that we have witnessed right before our eyes. I for one am constantly amazed at the differnce in quality of the piano as well as the quality of sound that is being produced in Asia. I will continue to discuss the various areas of the world that pianos are currently being produced in and the sound textures and differences that you can/should expect. Eventually in the transition of PianoSD I will be discussing various pricing and with the help of some others I will start to hopefully explain piano name brands and give my opinions on what you can and should expect with each. While pianos are my passion, I have a great love for piano teaching and a respect for the piano teachers and hope to promote thier craft. I am certainly trying to bring music education to Nipomo, Ca. where I presently manage The Piano Outlet. 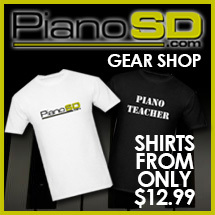 You can find us at www.thepianooutletco.com . I hope you enjoy this blog as much as I enjoy bringing it to you. If you have read my blogs at all, you know my biggest passion in life is the piano. There are a million reasons why but, I absolutely love this business. The people, teachers, technicians, dealers, enthusiasts, students and suppliers all work together to one common goal and that is simply to make music. Making music is the bringing together of all types of talents and joys in every walk of life to make a melody line and a chord structure. We have all suffered the economic downturns, some more than others but, through it all we have banded together to create a new world in the music business. As the changes in our website begin to take place I am getting more excited about the changes and really are expecting some really big accomplishments as we begin the process of changing the site over to a social directory, pulling all of the talents and names and information together. We are looking forward to serving the music community and hope that you will all stick with us and make suggestions when you can. AN EXPENSIVE DAY IN BAYREUTH!!! I just left Bayreuth and the Steingraeber & Sohne factory and am on my way to the Black Forest to visit the Sauter piano company. I was honored to be the first person outside of factory workers to play/test the new Steingraeber 192. THIS is going to be a fantastic piano! I am posting a picture for you to have a look. It is remarkable, and has the same action as the Steingraeber 212 – very quick and decisive and an immense amount of power for the size… think Steingraeber 170 on Steroids. All of you going on the PW European tour might be able to try it as well (if you beg and plead with Udo )I also played (for several hours) three Steingraeber Concert Grands and selected one to replace the one we just sold to composer Gordon Getty. The new one I selected is a fabulous instrument with majestic power and a depth of tone like the Grand Canyon. I am really excited about this instrument, BUT I am doing cartwheels about another piano I bought! During my “testing time”, two factory workers rolled in a 232 (7’6″) that had just come from being used for a recording. I sat down to try it and COULD NOT pull myself away from that piano for nearly one hour. IT IS FABULOUS. After begging, pleading, and SEVERAL glasses of Schnapps, I got Udo Steingraeber to agree to sell it to me. Anyone who wants to hear one of the finest pianos I have EVER played in my many years should either go on the PW Tour and ask Udo to play Russell’s D-232 or you can beat a path to Berkeley when it arrives. Now, on to the Black Forest area tomorrow morning for a visit to Sauter Pianos. Wow, what a great trip but my Mastercard is screaming! As if my visit to Bayreuth, and the Steingraeber factory weren’t enough to cause serious damage to my credit card, my visit to Ulrich Sauter, and the Sauter factory, resulted in me being waken in the middle of the night by my credit card shreaking in agony!First, you should know that the drive from Bayreuth to Tuttlingen is quite beautiful, and as you leave the city of Stuttgart and head into the Schwarz-Wald (black forest) the scenery becomes everything you imagined as a child reading Hansel and Grethel. The Sauter factory is located in Spaichingen, which is a small town in the larger series of “stadts” of Tuttlingen (best known for the worlds most advanced surgical devices – and coo-coo clocks) and Rotweil (as in the dogs, the Romans, and the oldest community in Europe). It is also the home of the Lake of Constance which has borders on France and Switzerland, and it is where the Danube River begins – so you get the influence of German baking, French sauces and Swiss presentation. My hotel was at the wood bridge over the mouth of the Danube (you should be jealous about now). I spent my first evening, after my drive, gorging on Venison in a lingonberry sauce served with Spaetzel (sort of noodles) and Spargel, which is white asparagus that is in season. Of course, we had to have something to wash all of that down, so Uli ordered a wonderful local white wine that went perfectly with our meal. Ah, life is good. Of course, dinner was followed by more schnapps. The next morning, a lite mist was over the valley when Uli picked me up from the hotel and we headed to the factory a few minutes up the road. My goal was to just take pictures of two pianos I already have on order for customers so that I could show them the progress and to try to get out of town without tripling my debt. Yeah, right, sure. While going from the office area to the main factory, there was a piano sitting in the factory concert area that stopped me dead in my tracks. True, it was the look of the piano that set my heart pacing, but when I sat down to it, I was left breathless by the depth and quality of sound. While I am lucky to represent many fine piano makers, and several are of comparable quality standard, I can’t think of any that equals Sauter in its ability to make uprights that equal the musicality of most grands. Add to that the stunning quality of the furniture and you have an unbeatable combination. This piano is called a “PURE”, and it’s cabinet was designed by Peter Maly, the “guru” of contemporary furniture design. It has a polished ebony background and the keyframe/keybed/fallboard is in polished Zambrano. Now, I had never seen or heard of Zembrano before, but Uli indicated it is in the Rosewood family. But really, saying it is like Rosewood is like saying wine is like grape juice. I am posting pictures on our FACEBOOK PAGE : LINK HERE – Scroll down to the end of the FB post for the pics. Well, I already have a great selection of Sauter uprights in my shop, with a few on order, so I began to plot what I could possibly do to get this one. I continued on my factory tour, taking pictures of my customer’s pianos, and plotting my next move on the Zambrano upright. Luckily, later that day, I was able to catch Uli in a well planned trap. You see, over the years I have visited the area quite a bit. And Uli knows that I won’t leave Tuttlingen without a visit to this one farmer who makes a combination apple/pear schnapps that you can buy. Oh Wait, YOU can’t buy it but I did :P. So, after lunch that is exactly where we headed. To my surprise, the farmer now has a sort of tasting room, and has added several other versions of his ware, including an “herb schnapps” which has a sort of rosemary/thyme flavor, a sort of anise schnapps, and several others – whose names I can’t remember for reasons better left untold (aka too much tasting). So, it was in this tasting room that I decided to make my move with Ulrich, and I convinced him to let me buy this piano now, with the agreement that if I haven’t sold it by NAMM, I will let him use it for the display in January. Heheh, I guess you could say yet another German piano maker has fallen into my schnapps trap. Together with the pianos I bought at Steingraeber, we are going to have a fantastic collection going into summer and fall. But, all that tough negotiating (read schnapps drinking) made me feel I deserved a bit of a vacation, so I headed to Zurich (one hour from Tuttlingen) and got on a plane for Barcelona – and on the beach I sit, writing this and drinking – I’ll bet you’re thinking Schnapps – no way, Sangria! Unfortunately, all of this ends on Monday when I have to fly back home to San Francisco to open the store on Tuesday, and rejoin Weight Watchers Tuesday night. I hope all the PW members going on the European factory tour have as much fun as I have had. And take it from me, if you fall in love with a piano on your journey and want to find a way to bring it home with you, grab the factory owner and a bottle of Schnapps and see where things go! So naturally I was very jealous!!!! I asked him if I could relate his story and he happily agreed. I hope you enjoyed his post as much as I did.